I'm often asked about the origin of the sewing needle and why I use it in my work. Thirty years ago, my idea of a sewing needle was one that represented domesticity and traditional women's work; a notion that I admired, but one that was not relatable... at least from the perspective of the Home Economics course I took in high school. In hindsight, I would have rather enjoyed Shop class, but, this was the early 1980's, and girls weren't exactly encouraged to take part in that realm of masculinity. So, it really is quite ironic that this domestic instrument has become so strongly tied to my imagery and identity as an artist. I've been called a "late bloomer", one of those age-marking labels that I've grown to dislike. I wed my husband Ross at the ripe old age of 30, when many of my friends were already raising families. Shortly after we married, we moved to Arizona, bought our first home, and settled in. By then a "non-traditional student", I resumed my Art studies at Arizona State University, and discovered an obsession with metal working. The sculpture shop at ASU was VERY different from my familiar (Augustana College, the small liberal arts school where I first began carving stone). At first I was intimidated, but soon felt a sense of empowerment like I have never known. I fell in love with metal casting. 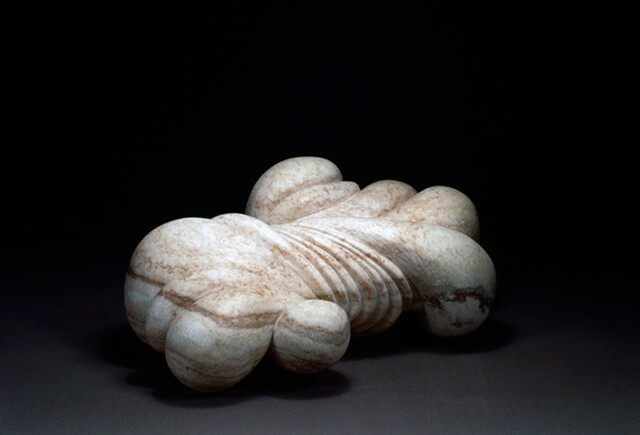 The process was seductive, magical, and much different from stone carving. But here, in this new environment, I found another meditative place to create. I was among classmates of all ages, both men and women, in a Foundry course taught by a woman. This was not your average high school Shop class from days of yore. I found my tribe, and from that moment on I was casting metal every semester until I graduated. It was the physicality of process that attracted me to Foundry work; the various mold making techniques, pouring the molten metal, the teamwork and choreography, the grinding, chasing and patination. The final product is a tangible record of thought and physical labor. After receiving my Bachelors degree, my wish was to remain at ASU, pursue an MFA, and continue my work in the Foundry. Instead, I was encouraged to explore new adventures elsewhere, and grow to find a new familiar, so that is what I did. For the next 3 years I divided my life between the University of Arizona in Tucson and our home in Mesa. The first year of graduate school was tough: living in an apartment again, being away from home, my husband, my dogs, my foundry friends, and feeling completely out of place. What was I doing here? I started experimenting with new materials, but hadn't really found my voice yet. So, I continued working with cast metal, focusing on large, singular forms-- no doubt a response to the isolation I felt. One weekend at home, Ross asked me to sew a button on his shirt. As I began to stitch, I became intrigued by the beauty of this everyday object and the irony of me using it. The sewing needle: a curious, simplistic tool, that in it's reflective material is always present. It has the capacity to mend, pierce, support, and when threaded leave evidence of a journey. I began to see the needle as a figure, as myself navigating my way. With newfound passion, I returned to my grad studio and set out to create a self portrait. I designed and constructed a life size figure out of Styrofoam, wax, and twine, then cast it in bronze. The result, Needle 5' 9", symbolizes a defining moment in my growth as an artist, and as a woman. It represents personal strength, perseverance, and for me, celebrates the "non-traditional". As I reflect on my education, and the many times in life when I wanted to give up and return to the comfort of the familiar, I think of the duality of experience and weaving through the highs and lows. What was once most difficult, turned out to be one of the best experiences of my life. It was my path. I was meant to be there, at the time I was there, and with the people that shared that time and space. Had I not been there, I would not be here. With fingers weary and worn, With eyelids heavy and red, A woman sat in unwomanly rags, Plying her needle and thread. My journey as a student of sculpture began with a 20 lb. piece of alabaster. Trained in the direct carving method, I worked intuitively with the material, using tools that felt familiar and comfortable, as if extensions of my hands. It was an organic, quiet process that spoke to my sensitive nature. The repetitive tap tap tap of the point and mallet foster the mind to wander, and the body to explore form. I immediately connected with this method, and the artists who define it: Constantin Brancusi, Barbara Hepworh, Isamu Noguchi, to name a few. The alabaster carving took me over 14 years to complete. I abandoned it, along with my college education, because I was lost. Years later, having gained maturity and responsibility, I resumed my studies along with my stone carving. One of my sculpture professors asked "Why would you want to work like that? It's like driving without a road map." I think this was more of a challenge of conviction rather than a critique. It is a traditional process far removed from conceptual art, and not many other students were chipping away stone at the time. Perhaps it is, and was, a road "less traveled", but not without intention. There is still a destination; one that doesn't simply appear but rather reveals and unfolds. Working intuitively takes time and patience, and cultivates a centeredness of mind, body, and material. For me, "that has made all the difference". Carving is the foundation of my practice, and remains an essential part of my art-making. I work with clay, cast metal, wood, plaster, paper, wax, and found objects. Though my current work is more research based and somewhat mapped out, the intuitive forms, shapes, and textures still emerge through the chiseling, etching, and cutting of materials. Looking back, what I learned from my stone carving was less about volume and mass-- and more about humility, direction, and the importance of intuition. I see it as a compass; guiding me to who I am and what I do-- which, to an artist, are one in the same. My journey as a student of sculpture continues, and with any luck, always will. Through the stillness and movement of everyday life, I search for center. If I listen closely, I know what direction to take. Carving is interrelated masses conveying an emotion; a perfect relationship between the mind and the colour, light and weight which is the stone, made by the hand which feels. It must be so essentially sculpture that it can exist in no other way, something completely the right size but which has growth, something still and yet having movement, so very quiet and yet with a real vitality.